Bring Elmo and his Sesame Street friends to visit at your next birthday party. 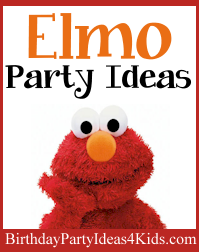 These Elmo birthday party ideas will keep kids entertained and will make planning the party super easy. On the front of solid red note cards glue on Elmo's eyes and nose. For each card cut out 2 large white circles, 2 small black circles and 1 orange circle that is slightly oblong in shape. Glue the 2 white circles in the middle of the card where they are touching and slightly overlap. Then glue the black circles in the middle of the white circles. Then glue the nose below the two white circles and have it overlap the white circles. Embellish red note cards with fuzzy red material or fur. On the front of solid red cards place Elmo stickers. Draw Elmo's footprints on the sidewalk and walkway that lead up to the party entrance. 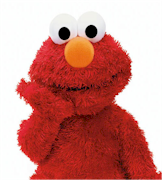 Make a sign above the party entrance that reads "Welcome to Elmo's World!" Use bright red tablecloths to decorate the party table and black, orange and white plates, cups and napkins. Cover the party table with drawing paper and let the kids draw with markers while they are at the table eating. Tape large poster boards to the walls (with newspaper or vinyl table clothes behind them and let the kids draw their own Elmo's world drawings with crayons or washable markers. Or if the party is outside tape the poster boards to a fence. Elmo loves to dance and so do his friends! You will need music and some type of music player where you can start and stop the music when you need to. Start the music and let the kids dance ... then tell them when they hear the music stop they have to freeze in whatever position they are in until the music starts again or someone says "unfreeze". Keep starting and stopping the music and each time having them freeze. Kids sit in a circle with two beanbags ... one named Elmo and the other named Dorothy. On go the children start to pass both bean bags clock wise around the circle. The object of the game is to see if the Elmo beanbag can catch up to the Dorothy beanbag. The kids will pass them faster and faster to see if they can catch up and also to run away from the other bean bag. When Elmo catches up to Dorothy start again. Small fish bowls or large plastic cups can be used for this fun game. You will also need ping pong balls. Since the plastic cups are not heavy you will need to hot glue the bottoms of the cups to a large piece of cardboard before the game. Line the bowls or cups up side by side so there are no gaps between the containers where the ping pong balls can fall through. Each player tries to throw 3 ping pong balls into the fish bowls to see if they can make them stay inside. This is game is harder then it looks because the ping pong balls will bounce around! Mark several random cups with a different color and give extra points if a ball lands inside it. Treasure Hunt (Treasure hunt game rules and instructions). The players solve simple clues to move on to another clue that will lead them to the treasure. Tell the party guests that Ernie has hidden the birthday cake and that Elmo has left them clues on where to find it. To make the party food even more fun using a cookie cutter cut sandwiches, slices of fruit, cold cuts, cheese or Rice Krispie Treats into letter and number shapes. Cut slices of fruit and place onto wooden skewers for fruit kabobs. Set up a cookie decorating station and let the kids decorate a big sugar cookie with candies, sprinkles and frosting for the Elmo birthday party . Bright red bags with red fur hot glued around the top. Glue large white eyes with black pupils and a big orange nose on the outside of a red partybag.